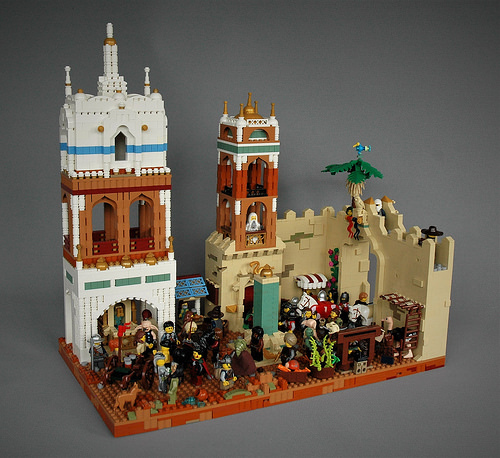 There are a wealth of details worth checking out in Andreas Lenander‘s latest LEGO creation — a busy marketplace in a Middle-East-inspired fantasy city — not least its unusual inhabitants. The city walls feature some nice little touches to break up the expanse of tan, and the detailing around the arch is spot-on. The towers provide a nice backdrop to the action, and the white one has some lovely texturing which delivers the impression of mosaics or elaborate carved screens. Below, the market itself is brimming with people and animals, creating a sense of activity and movement. You can’t look at this without finding yourself waiting on a big fight breaking out! 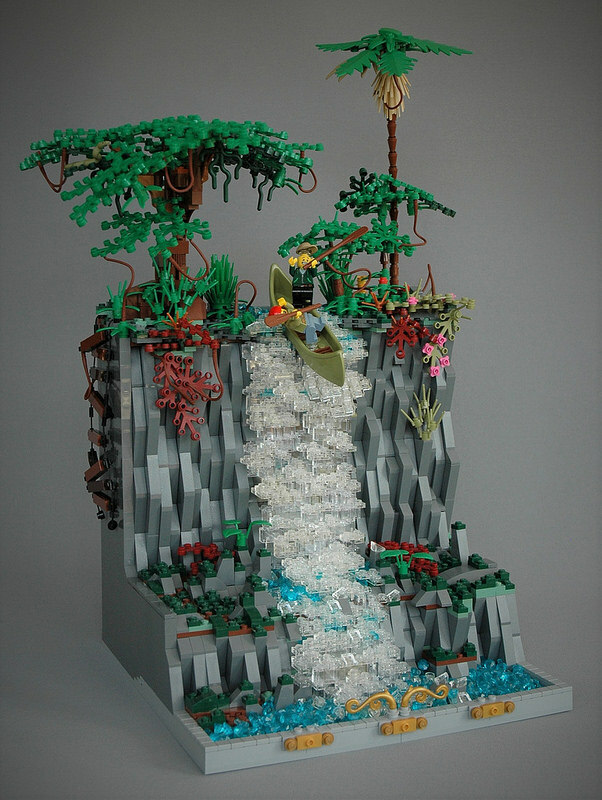 Sweden’s Andreas Lenander latest LEGO creation is a terrifying canoe ride right over the edge of a waterfall. 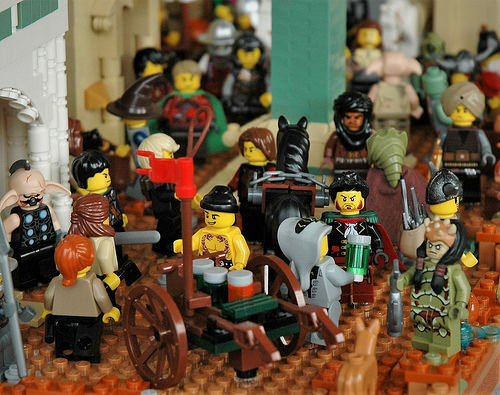 These minifigures certainly appear as though they’re on an adventure they’re not likely to forget. I think what strikes me the most about this diorama is the palpable dynamic energy of the rushing water, free-floating figures, and tipping canoe as the river crests the edge of the cliff. 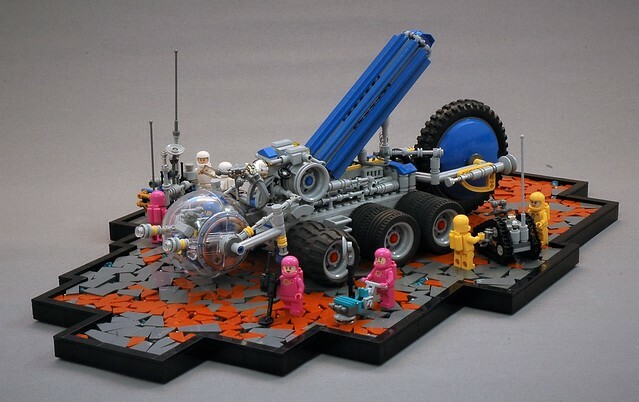 You could argue that there’s nothing particularly innovative about the techniques on display, but what Andreas has achieved here with a few simple, repetitive pieces is really remarkable. 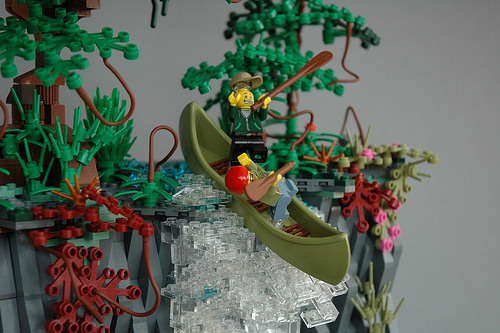 It’s a strong exhibit of how purposeful prop placement (the minifigs, canoe, water) over background noise (plants, splashing water, textured rocks) can achieve a visually interesting composition. This was the winning entry in Swebrick‘s head-to-head elimination AFOL-vs-AFOL contest, which for 2018 was based on Adventure. We’ve also featured Andreas here recently for his lifelike cigarette smoking in an ashtray and earlier this summer with his Titan starfighter.